Reading and share top 11 famous quotes and sayings about Fragility Of Life by famous authors and people. Browse top 11 famous quotes and sayings about Fragility Of Life by most favorite authors. 1. "Age makes you notice certain things. For example, I now know that a man's life is broadly divided into three periods. During the first, it doesn't even occur to us that one day we will grow old, we don't think that time passes or that from the day we are born we're all walking toward a common end. After the first years of youth comes the second period, in which a person becomes aware of the fragility of life and what begins like a simple niggling doubt rises inside you like a flood of uncertainties that will stay with you for the rest of your days. Finally, toward the end of life, the period of acceptance begins, and, consequently, of resignation, a time of waiting." 2. "The young man till thirty, never feels practically that he is mortal. He knows it indeed, and, if need were, he could preach a homily on the fragility of life; but he brings it not home to himself, any more than in a hot June we can appropriate to our imagination the freezing days of December." 3. "In the medieval tradition, Beksinski seems to believe art to be a forewarning about the fragility of the flesh– whatever pleasures we know are doomed to perish– thus, his paintings manage to evoke at once the process of decay and the ongoing struggle for life. They hold within them a secret poetry, stained with blood and rust." 4. "The fragility of crystal is not a weakness but a fineness. My parents understood that fine crystal glass had to be cared for or may be shattered. But when it came to my brother, they didn't seem to know or care that their course of their secret action brought the kind of devastation that could cut them. Their fraudulent marriage and our father's denial of his other son was for Chris a murder of every day's truth. He felt his whole life turned like a river suddenly reversing the direction of its flow. Suddenly running uphill. These revelations struck at the core of Chris's sense of identity. They made his entire childhood seem like fiction. Chris never told them he knew and made me promise silence as well." 5. "The only miracle we can perform is to go on living, said the woman, to preserve the fragility of life from day to day, as if it were blind and did not know where to go, and perhaps it is like that, perhaps it really does not know, it placed itself in our hands, after giving us intelligence." 6. "She was my friend and I loved her and relied on her, even though there were days when her moodiness and fragility frightened me, because they reminded me of my own tenuous grasp on life." 7. "Dead ButterfliesI sometimes think about the fragility of glass — of broken shards tearing against soft skin.When in truth, it is the transparency that kills you. The pain of seeing through to something you can never quite touch. For years I've kept you in secret, behind a glass screen. I've watched helplessly as day after day, your new girlfriend becomes your wife and then later, the mother of your children. Then realizing their only in thinking you were the one under glass when in fact it has been me— a pinned butterfly static and unmoving, watching while your other life unfolds." 8. "It was as if he'd suddenly become intimately aware of the fragility of life and how precious time really was. 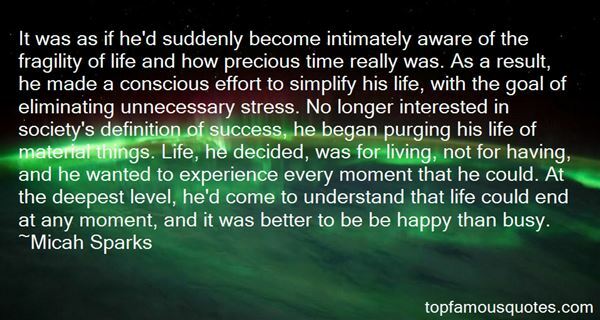 As a result, he made a conscious effort to simplify his life, with the goal of eliminating unnecessary stress. No longer interested in society's definition of success, he began purging his life of material things. Life, he decided, was for living, not for having, and he wanted to experience every moment that he could. At the deepest level, he'd come to understand that life could end at any moment, and it was better to be be happy than busy." 9. "Respect for the fragility and importance of an individual life is still the mark of an educated man." 10. "Truly embracing the fragility and tensions of life...brings with it the possibility of true joy." 11. 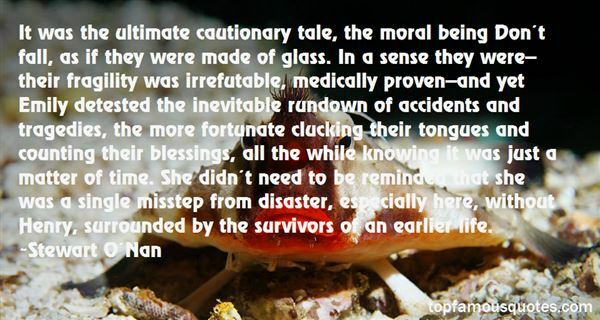 "It was the ultimate cautionary tale, the moral being Don't fall, as if they were made of glass. In a sense they were--their fragility was irrefutable, medically proven--and yet Emily detested the inevitable rundown of accidents and tragedies, the more fortunate clucking their tongues and counting their blessings, all the while knowing it was just a matter of time. She didn't need to be reminded that she was a single misstep from disaster, especially here, without Henry, surrounded by the survivors of an earlier life." It is quite a three pipe problem, and I beg that you won't speak to me for fifty minutes."